In what has become an annual ritual, the Dublin High School Irish Guard conducted a week long band camp that concluded on Friday. This was a week that was filled with students meeting new band mates, learning marching routines and music, a review of what it means to be committed to the band effort, fellowship, sweating out hot afternoons and simply a lot of fun. The days started at 8:00 AM and did not end until 4:00 PM. However, it was a week that none of the musicians will forget. Band Director Paul Everts spoke to families that attended the end of camp assembly in the Student Union. Upon his arrival at Dublin High in 2008, Paul inherited a group of 56 committed band members. The band program was as its early stages of development and he wondered aloud what the future might hold. In part, due to the great leadership of Erik Bertelson at Wells Middle School and Lee Carpenter at Fallon Middle School, nearly the same number of musicians will enter Dublin High this year as incoming freshmen, which takes the total number of membership in the Irish Guard to the 140-150 range. This remarkable growth truly speaks to the popularity of the band movement and music within this District. The general assembly discussion also included comments on the importance of fundraising and the Guard’s desire to participate in the Chicago International Music Festival in April 2014. Throughout the week, existing and new band members bonded through various exercises and quickly became friends. As with athletics, older students served as mentors and quickly introduced the routines to the younger members. Additionally, the band worked to hone their skills on three musical numbers which they will then be expected to demonstrate in performance during fall band reviews. The crescendo for the week was an opportunity for the Irish Guard to perform for their families. This was followed by a pot-luck style BBQ where everyone could relax by the setting sun and to reflect upon this last productive week. OneDublin.org would like to commend Paul Everts and all of his support staff and volunteers for orchestrating such a highly productive week prior to the start of the school year. The DHS Irish Guard should have a successful year because of it. Thank you so much onedublin.org for the continuous POSITIVE COVERAGE of Dublin High School and the school district. We have so much to be proud of and be thankful for . The week was amazing. We have much to anticipate – be it HOPEFULLY a fantastic trip to CHICAGO or moving into a STATE OF THE ART multi-MULTI million dollar performing arts facility!! 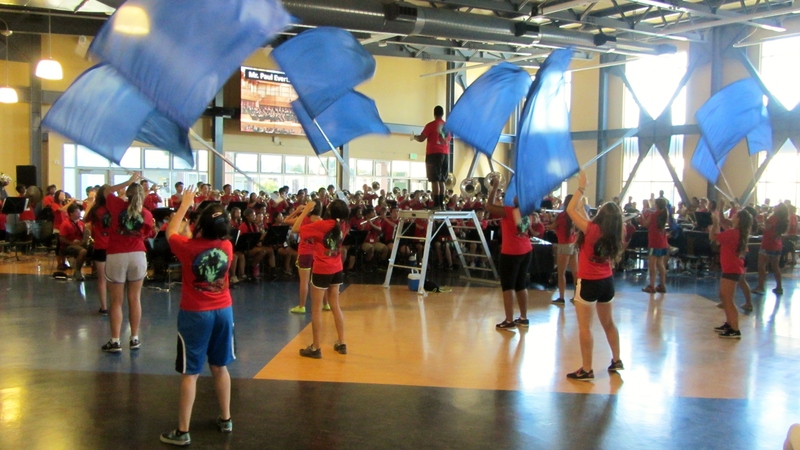 Yesterday (Aug.16th) was the climax of a wonderful week for our school’s band and color guard program. Being the band director at Dublin High School is a blessing. Thank you so much to the students and their parents/families for choosing to make the Dublin High School Band/Guard a part of your life.